Sydney Shop Girl: Life This Week 19/11/2018: The Best Cake I Have Eaten. Life This Week 19/11/2018: The Best Cake I Have Eaten. I'm a sweet tooth so there are several best cakes that I've eaten. They all have one thing in common, though. They were all made for or served at birthday celebrations. There's just a certain something about a cake shared to celebrate a special person in your life. There's all the ritual of gathering around said cake, singing 'Happy Birthday' and then the blowing out of candles (the number of which may or may not be a true representation of the number of years the birthday person has lived). I love the multiple phone camera shots that then take place as the candles are blown out and then as close family and significant others return from the wings for that group photo around the cake. Serving the cake is not without its own rules. There will always be those of us that want just a sliver, those who wish to share a slice, those (usually the children) who specifically want the slices with the most frosting or decorations. It's a rare person who completely opts out of the birthday cake. 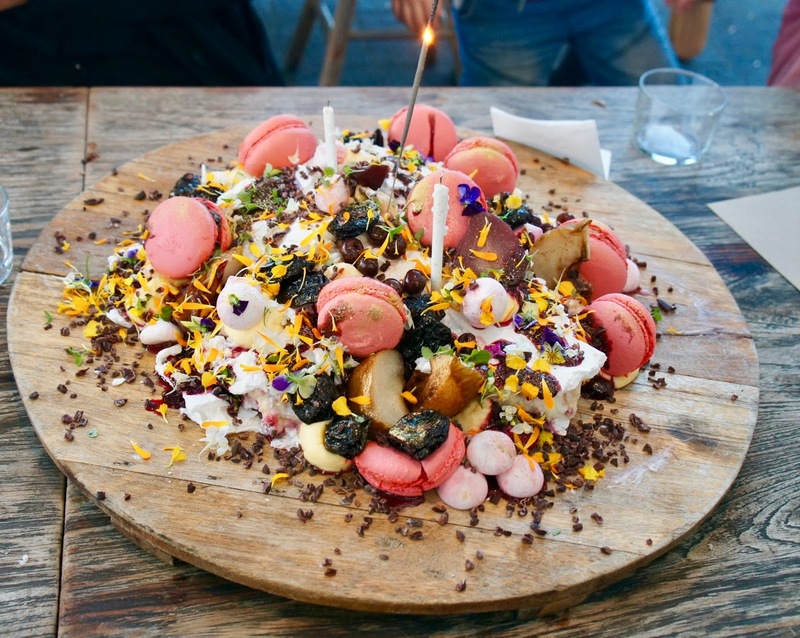 The cake in my photo was served at a friend's birthday at Camperdown Commons. I still remember the day well. It was winter but one of those beautifully sunny winter days that makes you forgive the season its freezing mornings. It was a Sunday afternoon and the mood was chilled out. Despite the number of youngsters we had with us. The boys had so much fun exploring the gardens, the staff and other families were all so accommodating and it was one of those afternoons that went on forever in the nicest possible way. The cake was actually more of a riff on an Eton mess. An abundance of fresh figs and macarons studded the lashings of meringue and cream. It was the perfect cake to share and the perfect end note for a very special Sunday afternoon. What's the most memorable cake you've eaten? That cake looks delicious! :) Of all the cakes I've ever had, I agree birthday cakes are the most memorable. I've so many fond memories of the cakes my mum made for my sister and I for our birthdays. I can't remember what they tasted like, but I can remember my absolute joy at getting things like a little mermaid cake made for me, or a teddy bear cake! This cake is gorgeous - so pretty, and, by the sound of things, so perfect. That cake looks divine! I've never made macarons, but really want to try my hand at them. 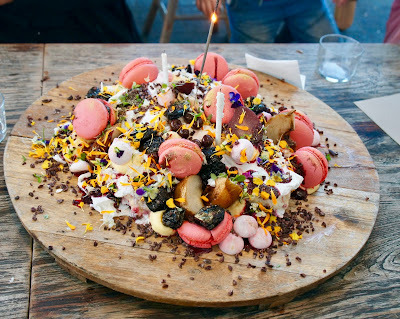 I'm not always a fan of macaroons, but this birthday cake looks so delicious (probably because I'm a sucker for an Eton Mess). I think you're right about birthday cakes being the most delicious and memorable. They've got so much sentiment attached to them! What fun that looked. Cake...the universal food of celebration. It sustained me post cancer surgeries !